One of Mick Foley's catchphrases in the ring while performing as Mankind was "have a nice day"
Football throws up some weird and wonderful stories sometimes. Exhibit A - wrestling legend Mick Foley was a guest of honour at Sheffield United's Championship match against Brentford. It all started with Blades captain Billy Sharp's 'Mr Socko' celebration at Norwich in January, a tribute to one of Foley's finishing moves in the ring. After scoring in the 2-2 draw at Carrow Road, Sharp pulled a sock from his shorts and delivered the 'Mandible Claw' submission hold to team-mate George Baldock. 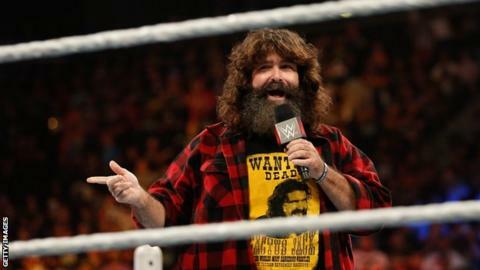 Foley, who wrestled under several aliases including Cactus Jack, Dude Love and Mankind, was alerted to the celebration on social media, and so began an unlikely alliance between United's top scorer and the three-time former WWE champion. "I'd say I've made a new friend and his wife Jade did a tremendous English breakfast for me," Foley, 53, told BBC Radio Sheffield. "Who expected it? I just happened to be scrolling through Twitter and I saw a headline saying 'this is the greatest thing you'll see all day' and I responded. It touches something in the hearts and minds of fans, they like it when these worlds collide. It makes people feel good. "People always say when you get older than you can lose your relevance but I've just made international news three times in a month!" Sharp added: "It was surreal this morning when he knocked on my door. I was taking my oldest son to school and I got a phone call and I just said if he wanted to come over for a cup of tea. He's a really cool guy and I hope he felt very welcome at my house." Chris Wilder's side are pushing for promotion to the Premier League and with a huge Yorkshire derby at promotion rivals Leeds on Saturday the boss made some changes to the usual starting line-up. "I'd flown all the way over from the States and I was like 'you're not playing? you're not playing?!' but when he came on he really gave his team an offensive threat," Foley said. The Blades recorded a 2-0 victory over the Bees, despite being reduced to 10 men after 35 minutes when fellow striker Gary Madine was sent off for a poor tackle. "This was my first English football game and I thought it was phenomenal. The red card changed the whole dynamic of the game and it made for a really exciting atmosphere," Foley said. "It was a great game. I'd love to come to another one and I'm a Sheffield United fan now. Pele's not my favourite player now, it's all about Billy Sharp. I'd go as far as to say we're buddies."